Sunday, the 9th of October 2011, the LitWorld Boys Club made an amazing trip to the renowned Nairobi Arboretum for an exciting outdoor learning session. The Nairobi Arboretum is a public recreational park situated in the outskirts of the city centre and is frequented by the city dwellers for hedonistic fulfillment. The site also provides room for games at the central lawn in the park. Having made a 30 minutes journey from Kibera to the park, the group settled down fast and begun with a read aloud session. 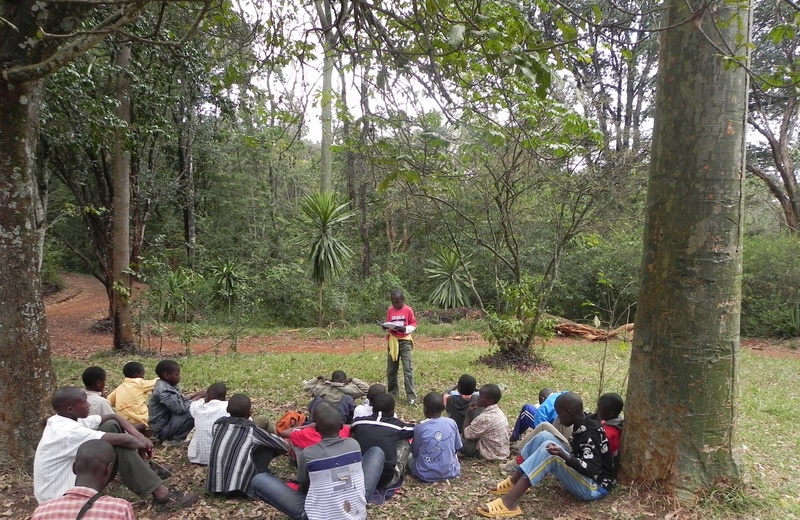 The read aloud method enabled the boys to read in turns about a story that highlighted the seven principles which form the basis for the Boys Club curriculum. It was meant to improve their comprehension, listening and memory skills during and after reading. They also had an opportunity to revisit some of the elements they had previously discussed during the in-door sessions. The engaging nature of the session also provided a platform for modeling curiosity and posing of questions that enriched the boys with proper understanding of the seven pillars. After the read aloud session, they also engaged in brainstorming activities, forming questions in groups and asking them to the other members. Later on, the boys sat down for their lunch which was followed by the stretching of limbs. Some jogged around the park, others roamed around enjoying the parks steady breeze and amazing scenery, yet others played soccer. At around 4.00 pm we re-converged and boarded our bus back to Kibera. It was a fantastic trip and all the boys enjoyed every bit of it. Newer PostKisumu LitClubs Receive Laptop Donations!